Question: Is there any way to get PDF document text language? Example: Let's say I have some PDF document in unknown to me language, is there any tool, that gives me opportunity to get PDF document language and translate PDF to the language I know. Is there VeryPDF any tool which can help me? Answer: According to your need, I guess you can convert PDF to word documents and then in Google translator, the language could be detected automatically and then translate it the to the language you are familiar with. There are two kinds of PDF file: image based PDF and text based PDF. If the PDF is text based, you can simply copy the content to Google translator for detecting language and then translate PDF. When handling image based PDF, things will go hardly to handle. When processing image based PDF, please OCR image PDF first to make PDF text copyable. Then you can translate PDF by Google translator. 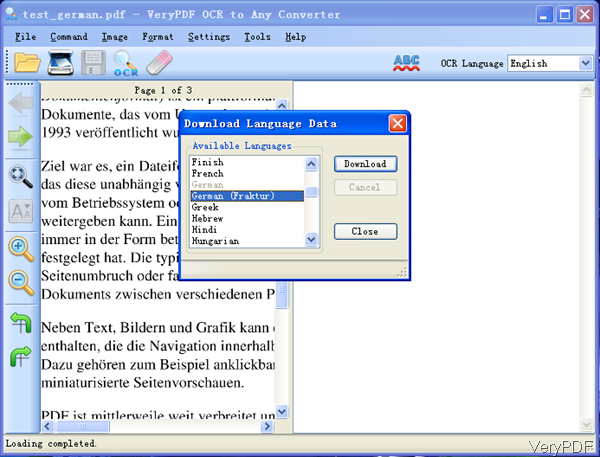 The software of VeryPDF OCR to Any Converter can help you OCR PDF to text and then you can translate PDF. Please check more information of this software on homepage, in the following part, I will show you how to use this software. There are two versions of this software: GUI version and command line version. Here I will take the GUI version for example. When downloading finishes, there will be an exe file. Please install this software by double clicking the exe and following installation message. The following snapshot is from the software interface, please have a check. When use this software to translate PDF, please click button File then Open to add PDF file to software interface. Or you can simply drag PDF file to software interface. If you do not know exactly what is the language in PDF, you have to guess and try several language. This software supports more than 20 OCR languages. Please click button Setting then go to Download language package. You will go to the menu like I showed above. You can download language package then OCR PDF. By this method the OCR recognition rate could be enhanced. When finishes OCR, the text will be shown at the right part. Then you can copy the text to Google translator for language detection and translate PDF. By this software and this method, we can get PDF document language detection a little easier and then translate PDF. During the using, if you have any question, please contact us as soon as possible. How to translate PDF from Spanish to English? This entry was posted in OCR Products and tagged translate PDF. Bookmark the permalink.